Interact with the applet below for a few minutes. Then, answer the questions that follow. 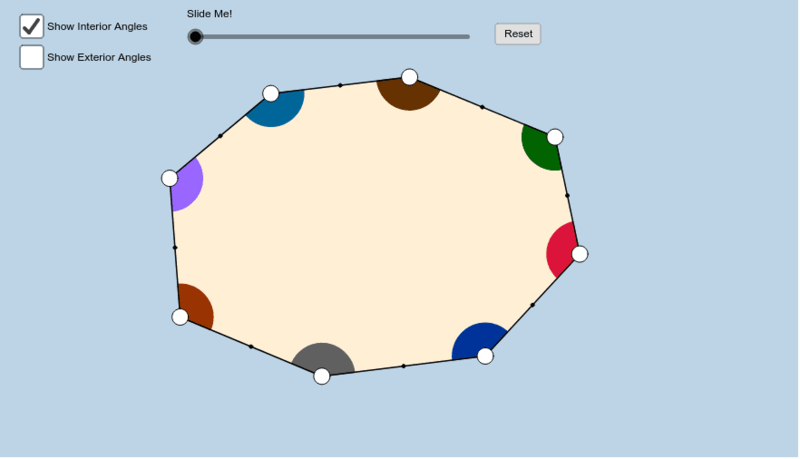 Be sure to change the locations of this octagon's vertices each time before you drag the slider!!! Note: The points on each side of this octagon are midpoints. Questions: 1) What happened when you dragged the black vertices? 2) When you dragged the slider to the other end, what happened? 3) From your observations, what is the sum of the measures of the interior angles of any octagon? 4) Select Exterior Angles. What happened when you dragged the vertices? 5) When you dragged the slider to the other end, what happened? 6) From your observations, what is the sum of the measures of the exterior angles of any octagon?